For fans of 60s psych and garage rock, you’d be hard-pressed to find a Brooklyn band more compelling than K-Holes. This band’s style is no prettified nostalgia trip. As their name implies, K-Holes’ energy comes from a dark place; a song where they scream the refrain “We are rats!” ain’t exactly to be featured on the next Strokes record. The New York of the K-Holes is the grittier world of the early 80s, and their sound reflects it. As one of many bands that grew up around the dearly departed Monster Island, one of many gentrification victims of the last few years around here, they’ve gotten to live a little bit of it, too. Besides the contrast in tone, this band also presents a different look and appeal than many of their peers. 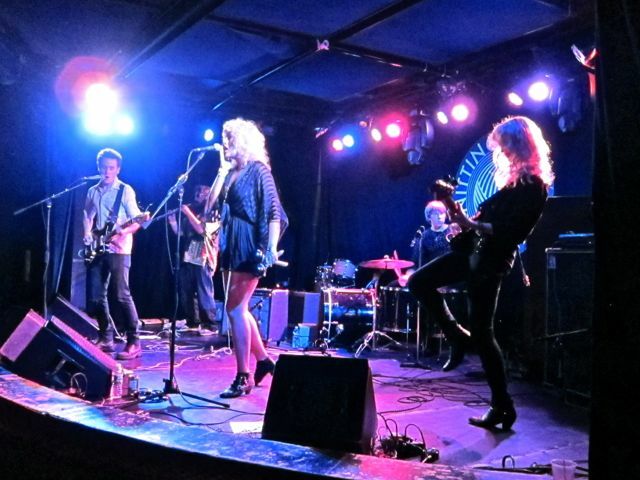 First, the band is a mixed-gender crew that consists of singer-guitarist Jack Hines, singer Vashti Windish, Hines’ wife Julie (whose uber-cool bass playing is perhaps the best visual in the band’s live show), drummer Cameron Michel and saxophonist Zumi Rosow. The male and female lead vocals, and Rosow’s sax flourishes, give the bands’ songs added depth and texture – and they also look a bit more exotic than, say, a trio of scruffy dudes. But ultimately, it’s the songs that get a band noticed, and K-Holes have got a ton of good ones, spread across their latest record on Hardly Art, Dismania, and their eponymous first album. “Child”, which leads off Dismania and closed this Knitting Factory set, is one of those clarion call-style tracks that demands to be turned up to 11, and the live version was a standout. “Rats” and “Numb” (streaming below along with “Child”) were two more Dismania tracks that absolutely killed. But no need to take my word for it; K-Holes will be on the bill at the epic Ty Segall / Thee Oh Sees Show at The Wick/The Well on September 22, and after that they’ll be in Europe for all of our friends on the continent. Do yourself a favor and don’t miss them. I recorded this set with a soundboard feed from Rob, the engineer at the Knitting Factory, and Schoeps MK5 microphones. Of my three recordings from this night (along with Night Beats), this is probably my favorite. Enjoy!